Dudus on Twitter? and a satirical look at the Mannatt Commission of Inquiry in Jamaica. Businessman. Entrepreneur. Philanthropist. Peacekeeper. 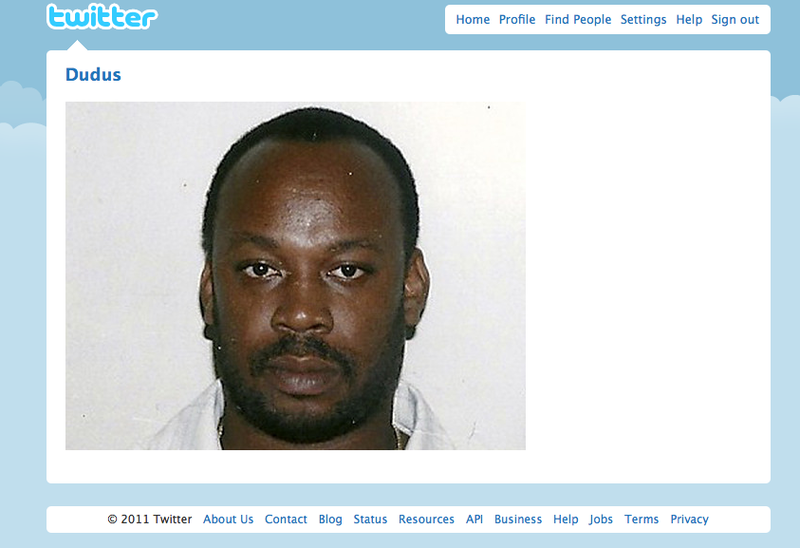 Proud Jamaican goes the bio on the Twitter page of the purported Don who was extradited from Jamaica last June. As The KD Knight Show, otherwise known as the Manatt Commission of Inquiry (an expensive investigation into the circumstances that led the Jamaican Government to allegedly hire the services of Washington law firm Manatt, Phelps & Phillips to influence the US Government to backpedal on its ‘request’ for Dudus’s extradition to the US to face drug running and other charges), rolls into its third or fourth week the Jamaican Twittersphere has suddenly become twice as interesting with the entry of someone tweeting as if they’re the imprisoned don, Christopher ‘Dudus’ Coke, languishing in a New York prison. Tweeting till lights off at 10pm – who keeping me company? #twitterafterdark scary in prison. Below, I’ve listed his tweets in ascending order…that is, you’ll have to scroll down to the bottom and read them bottom up if you want to be chronological. And while you’re down there you may as well check out the videoclip of Anthony Miller/Entertainment Report’s priceless take on the Manatt Inquiry from TVJ in which footage from the Inquiry is played in slomo to the theme music from Perry Mason. Both of these (and the cartoon below) are cause for celebration, political satire is alive and well in Jamaica. Enjoy! @bruceJLP Is this the PM or the Party Leader speaking? Put me on to NDM Bruce please. Former “gunman” on CVM – I see you still wear that shirt I bought you 6 years ago. I see you hater! Always marry rich. RT @Jherane_: Am I the only one who thought Veronica should’ve gotten with Reggie? Bought it from a guard 2nd hand #prisonlifehard RT @Moosie928: freedom is a must @dudusfromtivoli a which bb u a work wid? #endorsed RT @Mark_N_Amos: Mannat enquiry imo, is a waste of time, no time for the stupid politicians that jamaica has…..
#celebrity RT @phcjam: RT @panmediajamaica: People are heading home early just to watch the Manatt/Dudus Commission’s proceedings. Best friends stab you in the front. RT @anniepaul: @corvedacosta yes, is Babsy there as Dorothy’s best friend? A handmaiden to justice? Pray for me. RT @JBooMc: @dudusfromtivoli …. omg u answered hope all is well with u bossy babylon system is real messed up ! You’re telling me? Idle hands here in lock up. RT @jt_ninja: inactivity can be just as devastating. Keep walking. RT @frass28: @Skittleshoni no walk towards the light @Skittleshoni dont get dragged in u mite meet dudus and lie bout it. Babylon system. RT @nel_cc_nic: So since buju’s fate is set….whatever happen to Dudus? ‘Got lost in the system’? @bruceJLP Boss link up. I’ve got internet privileges in prison now. New to this Twitter thing. Big up to my supporters! Its good to have him in the mix 🙂 Monday will be exciting. Previous Previous post: Did Haiti Need this Blow, Jamaica?